Here at Mary Christine Photography, we are kicking the year off right! And that includes glitter of course! Miss Lila came in for her two year session and what fun we had! I have been photographing this cutie since she was a newborn, which is a great privilege for any Ohio photographer! It is crazy how much she has grown and changed over the last few years! It is always fun seeing her family, seeing clients like this are like catching up with old friends. Two year old can be extremely challenging to photograph. I have learned with my own girls never to ask any question, especially when they are two years old, because the answer will always be NO. Without fail. Every time. Prone to meltdowns and resistant to change, these toddlers are as adorable as they are challenging. So I knew that with the cold weather and being cooped up in studio, we had to plan something fun. Glitter is always fun. Always! We just used plain old regular glitter and had a ball tossing it, throwing it, and blowing it to create a little studio fun. It is also incredibly messy. What toddler doesn’t love to create a mess! 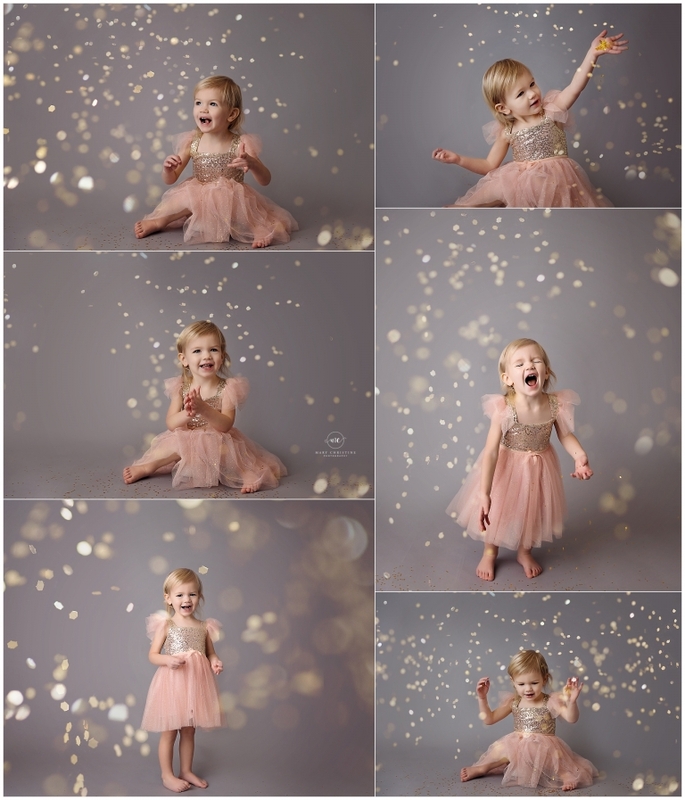 I love the variety and the joy that we were able to capture in just a few short minutes. And the best part? Lila was having a blast! While we were able to capture some traditional photos, these were by far my favorite from her session. They are joyful and magical. And, in my opinion, gorgeous! You can see how much this sweet girl has changed in just a short year here. Her floral cake smash is another one of my favorites! Looking for an Ohio photographer? Please contact Mary today to schedule your session!